U.S. natural gas pipeline exports to Mexico have been increasing following expansions of cross-border pipeline capacity. These exports averaged 4.2 billion cubic feet per day (Bcf/d) in 2017 and 4.4 Bcf/d through the first five months of 2018. Based on data compiled by Genscape, natural gas exports to Mexico by pipeline exceeded 5 billion cubic feet per day (Bcf/d) for the first time in July 2018, after the commissioning of several key pipelines in Mexico. By the end of 2018, an additional four of six major pipelines identified as strategic in Mexico’s five-year natural gas infrastructure expansion plan are scheduled to begin commercial operations. These newly commissioned pipelines will transport U.S. natural gas farther into Mexico’s central and southern regions and provide an additional outlet for constrained Permian production in western Texas. Natural gas exports from the United States will help meet growing demand from Mexico’s natural gas-fired power generation and industrial sectors, offsetting declines in Mexico’s domestic production. Currently, about three-quarters of U.S. natural gas pipeline exports to Mexico flow from southern Texas. Exports from southern Texas averaged 3.2 Bcf/d in 2017 and 3.3 Bcf/d through the first five months of 2018. This natural gas is sourced primarily from the Eagle Ford Basin in Texas and transported on an existing pipeline network to serve industrial and power sector customers in northeastern Mexico. Exports from western Texas, however, have been limited, despite a significant increase in cross-border pipeline capacity from 2015 to 2017. Exports from western Texas averaged only 0.4 Bcf/d in 2017 and 0.5 Bcf/d in January–May 2018. 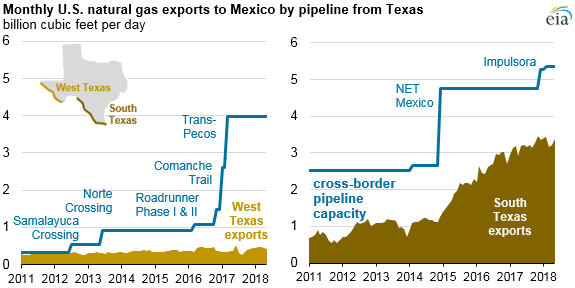 Significant delays in construction of the connecting pipelines on the Mexican side of the border have led to relatively low utilization of cross-border pipeline capacity from western Texas. Some pipelines in Mexico have been delayed by more than a year from their original expected in-service dates, in part because of disputes contesting pipeline routes. Several key pipelines in Mexico were placed in service earlier in 2018. La Laguna-Aguascalientes (1.2 Bcf/d) and Villa de Reyes-Aguascalientes-Guadalajara (0.9 Bcf/d) are scheduled to begin commercial operations in November 2018 after the interconnect at El Encino-La Laguna is completed in October. These pipelines will transport natural gas from western Texas into central and western Mexico through the Ojinaga-El Encino and Tarahumara pipelines. Natural gas from these pipelines may displace some imports of liquefied natural gas (LNG) at Manzanillo LNG terminal and will serve markets in Guadalajara, Mexico’s second-largest city. Samalayuca-Sásabe (0.5 Bcf/d capacity) is scheduled to begin commercial operation in November 2018 and will primarily serve new natural gas-fired power plants in western Mexico. Additional export capacity from southern Texas totaling 3.0 Bcf/d will begin commercial operations later this year. 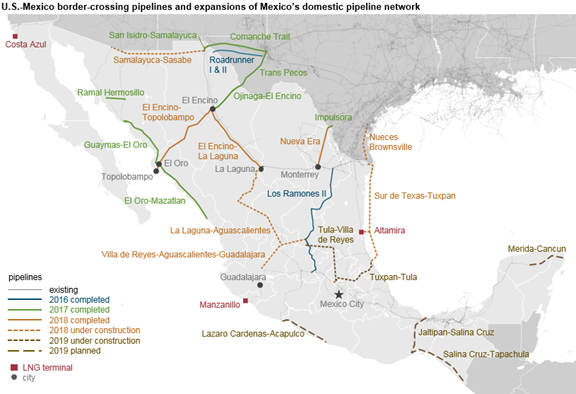 The U.S. Valley Crossing (also called Nueces-Brownsville) pipeline (2.6 Bcf/d capacity) will connect to Mexico’s Sur de Texas-Tuxpan underwater pipeline. Both pipelines are expected to be placed in service in October 2018. However, pipelines at the other end of this underwater pipeline have been delayed. The Tuxpan-Tula pipeline (0.9 Bcf/d capacity), which connects Sur de Texas-Tuxpan to markets in central Mexico, is delayed and is not expected to begin commercial operation until 2020. Another pipeline near Mexico City—Tula-Villa de Reyes (0.9 Bcf/d)—has been delayed until 2019. Until these pipelines begin commercial operations, the high-demand market around Mexico City is expected to continue to be served by existing pipeline infrastructure transporting natural gas from southern Texas.